Arthel Lane Watson, later known as “Doc”, was born near Deep Gap, North Carolina in Stoney Fork Township in March of 1923. Doc was left blind from an eye infection as an infant, which is a huge part of why he was such an inspiration. At an early age he showed an interest in music and this was also encouraged by both of his parents to rise above his disability and pursue his dream. His father, General Dixon Watson, led singing at the local church and his mother, Annie, sang old-time ballads at home. The first instrument Doc received was a harmonica for Christmas at the age of 5 or 6. At age 11, his father gave him his first fretless banjo, which is said to be made from the skin of the families recently deceased cat. The next instrument Doc decided to pick up was the guitar. He taught himself to play the Carter Family’s “When the Roses Bloom in Dixieland” and right after this his father bought him his own guitar. He was 13 when he received this guitar which was a $12 Stella acoustic. He learned songs he heard on radio broadcasts from The Grand Ole Opry. During his teen years, Doc took his talent to the streets! He and his brother, Linney, would perform on street corners in the town of Boone, North Carolina, which was a nearby town. His first national recognition came during the old music revival of the early 1960s. 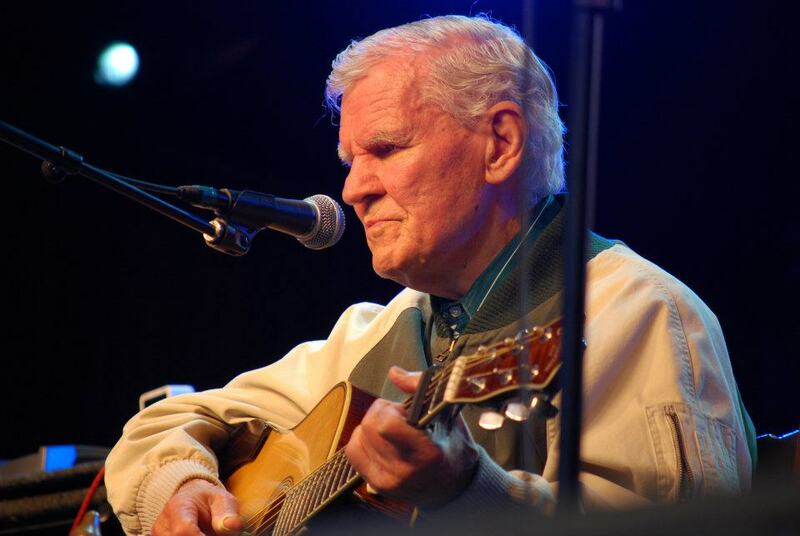 He performed at the Newport Folk Festival in 1963 and released his debut album Doc Watson and Family the same year. 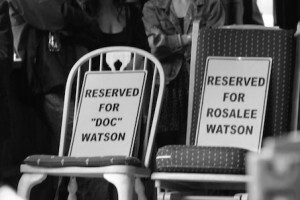 The performance at the folk festival was a huge break for Doc. The next year, Doc decided to put his family into the show. His son, Merle, who was 15 at the time, joined him as his guitarist. Father and son duo performed together for 20 years. They received Grammy Awards for albums Then and Now(1974), Two Days in November(1975), and Big Sandy/Leather Britches(1980). Doc and Merle toured the U.S., along with other countries, until Merle’s death in 1985 after a tractor accident. After Merle’s terrible death, Doc returned to music, winning Grammy’s for three albums; Riding the Midnight Train(1987), On Praying Ground(1991), and Legacy(2003). With his unique style of guitar playing, Doc helped mold folk and rock music into what it is today. 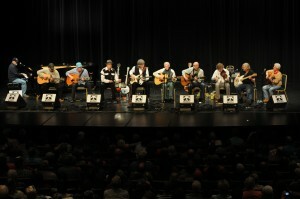 Doc referred to his flat-picking guitar playing style as “country pickin”, while fellow folk artist Bob Dylan once compared his guitar playing to “water running”. 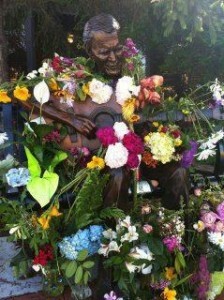 The death of Doc Watson was sudden and unexpected. He died at age 89 on May 29, 2012 following complications from abdominal surgery. On that day, his community not only lost a hero, but the world lost a true talent and inspiration to individuals of all ages and walks of life. He is now honored at the bluegrass festival, MerleFest, that was created to remember his son, Merle. The festival is held in Wilkesboro, North Carolina on the last weekend of April each year. The four day festival features music from all over the world. 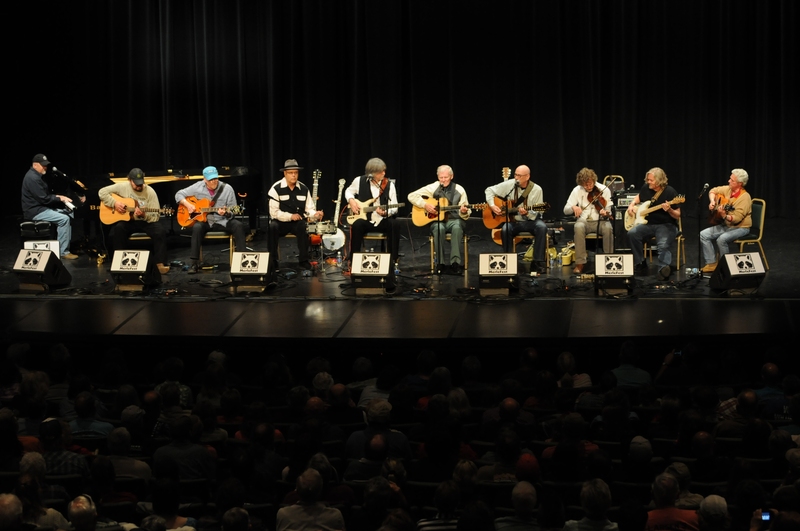 Some of the 2013 festival headliners included; The Avett Brothers, Tift Merritt, Sam Bush, John Cowan, The Charlie Daniels Band, The Kruger Brothers, Jim Lauderdale, and Rhonda Vincent and The Rage. The weekend was filled with Doc inspired songs and beautiful tributes by some of his greatest fans. Doc and his kind spirit will be missed by all that knew him, but his music will live on.